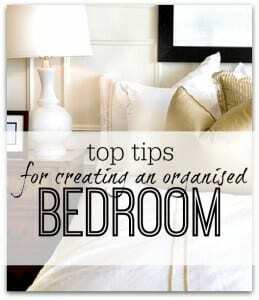 Top tips for creating an organised bedroom - style as well! There’s nothing better than going up to bed at night, safe in the knowledge that you can rest and relax in your bedroom easily – and for that to be a reality it needs to get organised. 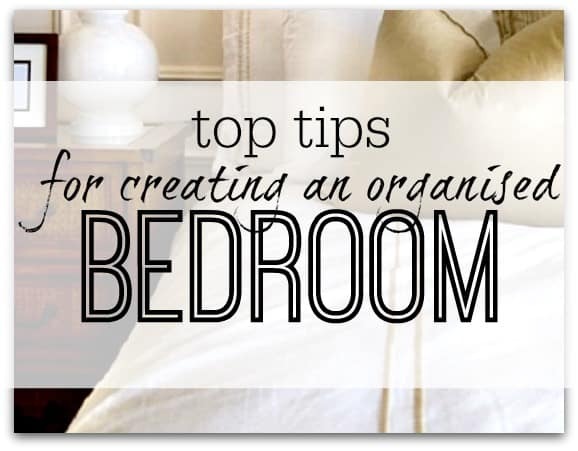 Here are my top tips for creating an organised bedroom – hope they help! What is an organised bedroom? If you had to say what you think constitutes an organised bedroom – what would it be? Not a great look – and not very condusive to a great nights sleep. When I look at a master bedroom, or a guest bedroom for that matter, I want to see something that resembles a hotel room. Why? Well, a hotel room has sumptuous fabrics, a large cosy looking bed, and no clutter to get in the way! It screams relaxation at you – there are no little jobs that really should be done, and nothing to tidy or deal with at that very moment. Everything is useful and has a place in the room. People often assume that if you try and achieve a hotel look for a bedroom then you take out the character, but far from it – it can still have bags of personality. You choose the colours, the fabrics, the bedding, the furniture – and this makes it totally your space – its just that without clutter it will be fresh, clean and simple. What do you want from a bedroom? I am sure that most people would like to have a place that they can fully relax, have a great nights sleep, and forget about the world for a few hours. To get to this though, it needs to have been organised – just like a hotel room where things are in their place, there rae always clean sheets, and everything looks good the majority of the time. To get to this we need to look at systems and habits – and I truly believe that these will make your life that much easier – and thats what we all want really now isn’t it! I really hope that these tips help to create your dream room for you too. This small habit can really make all the difference. If you make your bed this is the largest expanse of space in most peoples rooms, and therefore it will immediately make the room look more tidy. You are then less likely to clutter it up, and more likely to sleep well in a more relaxing environment – and it usually takes less than a minute. One for summer (around 4.5 tog) and one for winter (around 9-10.5 tog) – this means that at the end of the season you can get each quilt dry cleaned while you are using the other, and it will be clean and ready to go when it is used next. You can even get quilts that have 2 sections **, so you can unzip and use each for the required season, and have them both together for a really cosy night! Wherever possible it’s best to always have spare bedding to hand. You then know exactly where it is and its easy to get when required. This is especially useful if there is an accident in the night like you spill your drink on it, or you are ill and sweating/sick so it needs changing urgently, or for children if they have accidents (as they all do from time to time). Another way of doing this if you don’t have the space to store bedding in each room is to store it altogether in a linen cupboard or somewhere suitable (ideally on the landing so all rooms can access it), is to have seperate colours for each room/person. That way you will be able to easily grab that which belongs to the bed you want to change. Lastly – to make things even easier (I said this was going to be useful! ), why not put all bedding for each bed into one of the pillow cases for that bed. That way its stores really neatly and is easy to grab quickly when you need to. You will have a more rested nights sleep if you can’t see clutter or work that needs doing. This is the room over any really that you need to keep as minimal as possible. Have only the book that you are currently reading, a clock, a light and room for a glass of water on your bedside table, and put all clothes away straight away – keeping on top of the daily clutter will keep maintenance of this room to a minimum. Think hotel chic and you won’t go far wrong! Why not add in a few quirky items to personalise the space so it’s truly yours. What about a coat stand to display some dresses, or a folding screen to create a more private dressing area – this is your space, so use it to add storage and functional items that are beautiful – this will relax you. Of all the rooms in your house this is the one that can be most personal to you. It is the one that the fewest people will see, and therefore have some fun with it! You never know when it may be needed. Have bedding ready to put onto the bed – or have the bed made up (whatever you prefer), have a selection of toiletries for guests to use, and if there is an ensuite, ensure towels and toilet rolls are there ready. Doing this will save loads of last minute stress when someone unexpectedly drops by – it also immediately makes a guest feel welcome. A guest bedroom is not a spare room really – it is waiting for guests, and also may be used by other members of the family at certain times (your partner may need to be up early and not want to disturb you etc…). Try not to think of it as a dumping ground that’s “out of sight, out of mind” (as guest rooms often are) – because you can be guaranteed that when you need it, it will be so much harder to get ready and therefore stress you more than necessary. TIP – I love the tip I heard the other day about how to get your guest bedroom ready and ensure you have got it right – and that’s to actually spend the night in it! So simple but so effective. Then you can be sure that the guests have everything they need. Minimising the furniture you have in the room while maximising the storage will ensure that you have a restful space to sleep. I particularly like to use chests of drawers instead of bedside tables where possible – this eliminates the often wasted space either side of the bed – and negates the need for a separate chest of drawers elsewhere in the room. It also looks better in a master bedroom as bedside tables can look really small and insignificant. Really think about what you need in the room, what needs to be stored there, and then work out what you really need to have to accommodate it. You may be surprised at how little furniture is actually required. If you have your clothes in your bedroom, then think about organising your wardrobe well so that you can find everything easily (I wrote a step by step guide with a free printable a while back that may help if you want to tackle this project yourself – click HERE). There’s nothing worse in a bedroom that opening the wardrobe and drawers to find a mess – this purely means that you will end up having to make more mess trying to find what you need each day. You will get exasperated, and are less likely to look after the rest of the room if your clothes are unorganised. Under the bed is a great place to store out of season clothes, spare bedding, blankets etc… – just ensure that they are in air tight containers as this space can get dusty easily. Try specific under bed storage** and ones with wheels can make access even easier. If your budget allows, get a bed that has built in storage under the mattress – I recommend this as you then get maximum storage and easy accessibility. An ottoman at the end of the bed ** is also a great idea as this will store loads and becomes a good seat when dressing. This easy addition will make it easier to get dressed and you won’t have to keep sitting on the bed, which can sometimes be low, or have someone still asleep in it! It also gives a place to come to read a book if you are struggling to get some quiet time in the rest of the house. Try not to have a desk / your home office in this room as it will make you feel that you need to be busy rather than relaxed. If you really have no other space for this, then at least try and have it hidden away a little so that it can be out of sight! (a dressing table is a great option as this can double up as a desk top when needed. You both need to feel relaxed in the space too – so think about this when choosing decor and when organising where things will go . Theres’ no need to put your partners clothes on higher rails in the wardrobe if they are shorter than you – this will just cause frustration. Tip #14 – Have you considered your windows? Consider your window treatments – do you like to wake with the sun rising, or prefer a blacked out room? Do you work shift and need to block the light of the day so you can sleep? Using the right curtains/blinds can make all the difference to feeling rested each day. Shutters are a great way to control the amount of light in a room – or use blackout lining on curtains/blinds if you love to sleep in the dark. Are you using the right room for each bedroom? Would your children sleep better if their room was over a lesser used evening room (rather than hearing you watching TV or having a dinner party), would you sleep better at the back of the house, would guests be better with the room with an ensuite so that they have complete privacy? You don’t have to follow what others do – think what would work best for you and your family in your home. Tip #16 – Think about how you use the room – and who uses it! Think about you and your partner – or whoever uses the room . If you love reading in bed and your partner prefers to go straight to sleep, then consider having a dimmer on the light (touch activated lamps** are great for this) as then you can lower the light to enable them to sleep more easily while still giving you enough to read. Consider others and you will both feel more comfortable in your space. I personally have changed quite a bit in my master bedroom over the years. We now have chests of drawers where there were once tiny little bedside tables. This has had a massive effect on the look and feel of the room as it has freed up the rest of the room for a lovely armchair in the window area, and a wall of wardrobes. We also have a massive storage bed and I am not kidding in how much storage is under it – you’ll be amazed! In our guest room we have a smaller storage bed where we store all the seasonal clothes and presents for people, and have a large chest of drawers where I keep all our cards and present wrapping items. This is a good room to do wrapping in as its quiet and away from little eyes! I do intend to have some hooks where guests can hang items, but as they only usually stay for 2 nights max they don’t really need a wardrobe for this. Can’t wait to hear how you get on…. My daughter has a small bedroom and we are trying to find creative ways to store her toys so I am glad that I found this article! You make a great point that you should use pretty items for storage like nice boxes that can be stocked or kept on top of the wardrobe. Also, I love that you say to personalize the space and make the room as quirky as you are because my daughter definitely has her own unique style! I agree completely with Tip#1! Not just because it makes the room look tidy, but also because I don’t want my sheets to collect all that dust. Making the bed is a sure way to prevent it from accumulating all of this dust and calls for less cleaning afterwards. So yes, always make your bed, every single day! Love the idea to sleep in your guest room to make sure it is ready for guests at all time. Doing that tonight! How did it go Debbie? It’s a really interesting thing to do as it gives you a whole new perspective doesn’t it! Hi Chrissy, I discovered there was some extra amenities I could provide. Added a water carafe on the night stand by the bed and a night light. And, decided to switch out the curtains to room darkening. Now, it is ready for company! Thanks again for the motivation and suggestion! That all sounds great Debbie! really pleased it made a difference and I hope your next guests love staying in the room! Hi. I really like what I’ve seen of this site so far. I wanted to ask if you have any tips for organising a teenager’s room/room for young adult/dorm room. While I love the tips for organising the bedroom, many won’t work for me, since I need to sleep, work, and store most of my things in one single room. I’d be super grateful for any tips. Hi Jerneja – great idea for a future post – I shall write that one down and get to it as soon as possible – it’s true that this is a completely separate idea for organising and needs different tips. I love the sound of your house – I can imagine it looks perfect! My main issue seems to revolve around toiletries/cosmetics…any tips? I unfortunately have no space for a dressing table. I have a few small shelves,but they are only tall enough to fit the odd bottle of perfume, or small body lotion, certainly not the hair spray and mouse and deodorants that I do use on a daily basis and would like to have easy access to. I’m afraid if I tuck them away into part of the wardrobe somewhere, they end up being taken out, and left about…and that only puts me in a bad mood!! Any advice would be fantastic!